Boeing Defense, Space & Security manufactures military aircraft and munitions in St. Louis. With two major auto and truck assembly plants, plus another just over its western border, Missouri owns an enviable chunk of North America's "automotive alley," which stretches southward from the Great Lakes to the Gulf of Mexico. The Kansas City metro area, where Ford makes the number-one selling F-150 and Chevrolet manufacturers the Malibu, by some estimations is the second-largest auto-industry hub in North America, after Detroit. Ford's Kansas City Assembly Plant, which, before the F-150 produced such classics as the Falcon, Fairlane and Mercury Comet, has generated thousands of jobs and millions of tax dollars since it started production in 1951. In Wentzville, west of St. Louis, General Motors makes the Chevy Express and Chevy Colorado and their sister GMC vehicles, the Savana and Canyon. 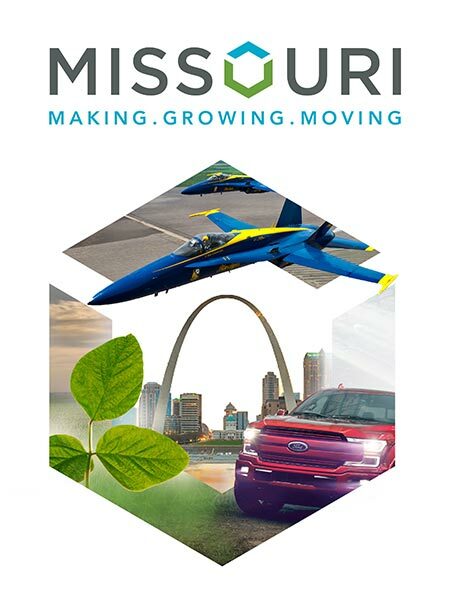 In 2017, Missouri automotive manufacturers built more than 756,000 vehicles, and since 2010 more than $2.36 billion has been invested in Missouri's automotive facilities. The state's network of auto suppliers also feeds GM's Fairfax Assembly plant in Kansas City, Kansas. Nearly one in ten Missouri workers is employed in manufacturing, with automotive and aerospace being the sector's largest components. Boeing Defense, Space & Security, in St. Louis has more than 14,000 employees in the state, makes the F/A-18, F-15 and EA-18G in Missouri. The company has announced that if it wins the highly-anticipated Defense Department contract to build the TX training jet, St. Louis will be the place. The contract is worth more than $600 million. Arnold Defense, in a suburb south of St. Louis, manufactures more than 1,000 rocket launchers per year. The company also serves a variety of markets beyond the military, including medical, transportation and original equipment manufacturers. Hazelwood-based GKN Aerospace builds parts for Boeing, Lockheed and other aerospace manufacturers. Orbital ATK Small Caliber Systems is a leading maker of ammunition at its Lake City plant in Independence. Supporting such knowledge-intensive enterprises requires a workforce heavy on engineers, and Missouri has the educational chops to sustain it. "We've got a number of universities and colleges and technical schools that are focused specifically on some of the aerospace and advanced manufacturing areas," says Subash Alias, senior vice president of Missouri Partnership. Such educational offerings include automotive programs at Ranken Technical School in St. Louis and Kansas City's Metropolitan Community College. St. Louis Community College maintains an aerospace training program that serves as a funnel for Boeing. Missouri University of Science and Technology enjoys a solid reputation for engineering. Missouri's quarter-million strong manufacturing workforce also wins recruits from technical training courses that dip down into the state's high schools. Missouri ranked 6th in 2015 for number of completed apprenticeships, with more than 8,600 total apprentices enrolled. LMV Automotive Systems employs approximately 340 people at its suburban Kansas City, Missouri, facility, where it manufactures welded body assemblies for automakers. LMV has entered a partnership with the Northland Center for Advanced Professional Studies (Northland CAPS), an organization that provides high school students with opportunities to gain exposure and skills related to high-demand, high-skill professions. "These students," says Alias, "are actually working on real, live automotive issues on actual production lines." LMV also used a state-funded programs to establish a training center anchored in robotic welding that helps develop weld technicians, tooling technicians and maintenance personnel. "We are proud," says LMV General Manager Andy Hrasky, "to have built a strong partnership with the state of Missouri and the local community to create opportunities for our employees and build the automotive market in Kansas City. "Our world class manufacturing facility, now with its own world-class training center, gives us a competitive advantage and a solid position from which to grow with our customers."